I’m so looking forward to that time of year where the weather will start to change, the leaves will start to turn colors and fall from the trees, and the crock pots will be pulled out from the cupboard. Oh how I love Fall. 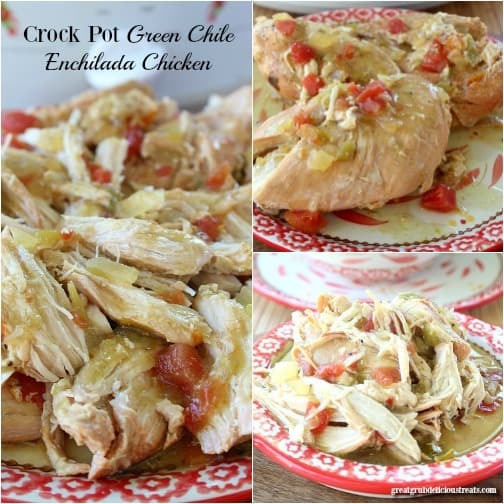 This green chile enchilada chicken made in the crock pot is super easy to make and can be used for many different meals throughout the week. This recipe only takes 5 ingredients, plus some seasoning and that’s it. 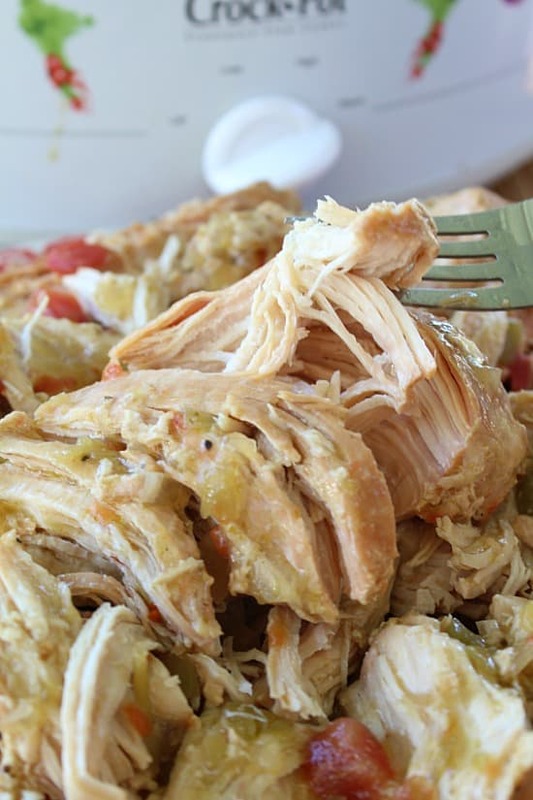 Put all the ingredients in the crock pot and go about your business, then when it’s time for dinner, this delicious crock pot green chile enchilada chicken will be ready to serve. 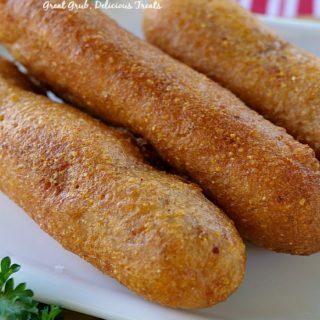 With this recipe, I also made some crock pot green chile enchilada chicken flautas which tastes so delicious. I’ll be posting that recipe quickly after this one. 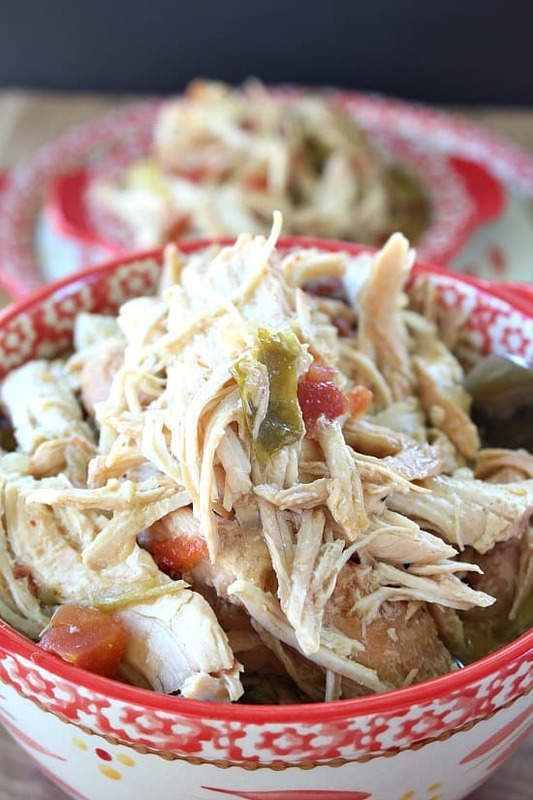 So grab your crock pot and get ready for a couple awesome recipes coming your way. Look how moist this chicken is. 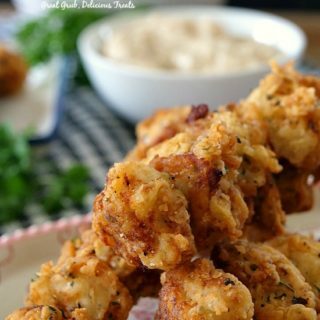 So tender, and the flavor is awesome. I wanted this to be super simple and have all the taste available with the least amount of ingredients. 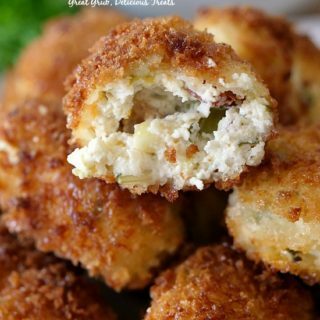 You can also add some diced jalapenos and additional seasoning, but you do not need to. The flavor is perfect. This would also be great served with some rice, or just by itself. 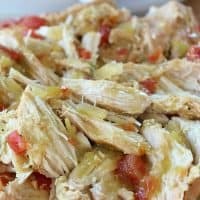 Chicken enchiladas can easily be made as well. 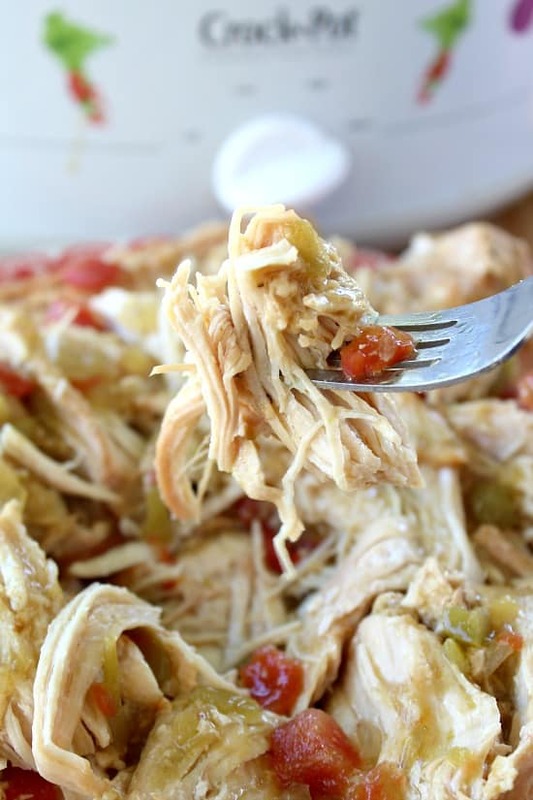 Just use this shredded chicken, add your favorite enchilada sauce, olives, gobs of cheese and your favorite tortillas. You can pop it in the oven on 350° for about an hour and you’ll have some great tasting enchiladas. My favorite way to cook is in the crock pot. You just have to throw the ingredients together, turn it on, and forget about it. That’s what I did when I made this. It was about 11 pm on Friday night, I had worked all day, and I knew I wanted to make a couple crock pot meals for the blog. By morning, everything was done and the fun began. 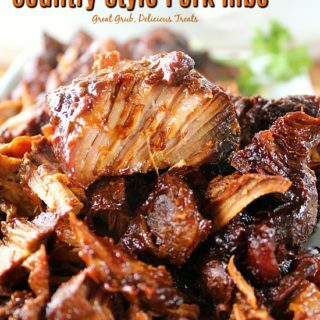 Crock pots rock! Turn 5-6 quart crock pot on high. Add chicken, onions and season with garlic salt, salt and pepper. 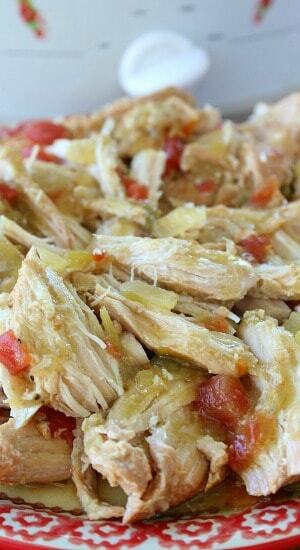 Pour enchilada sauce, Rotel® and diced green chilies over chicken. Cover and let cook on high for 6-8 hours, or low 8-10 hours, or until chicken falls apart easily. 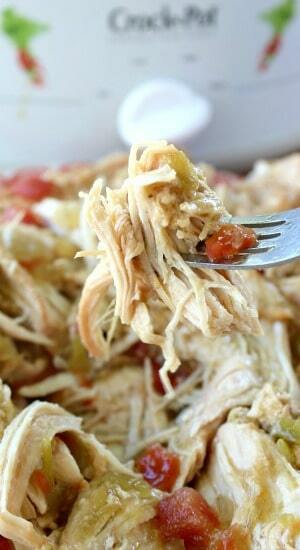 Remove chicken from crock pot and put in a large bowl or plate. 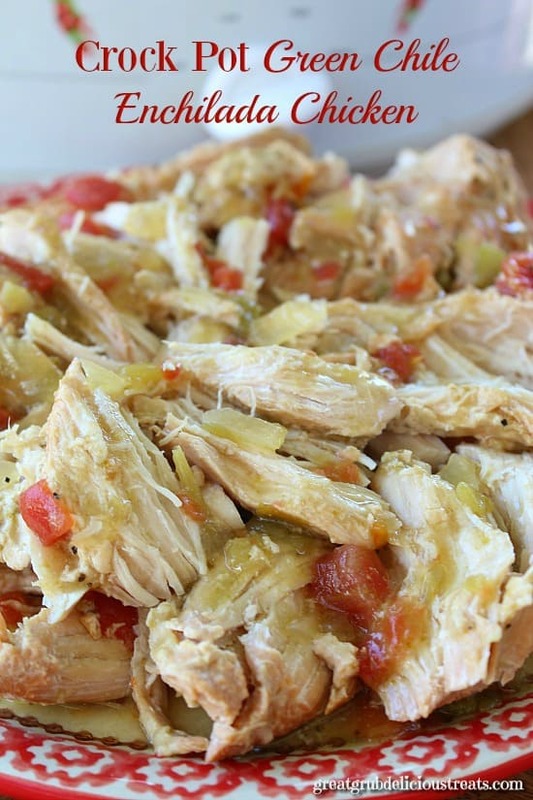 Can serve over rice or you can make my Crock Pot Green Chile Enchilada Chicken Flautas. It smelled sooo good while it was cooking in the crock pot. I cut up some tomatoes since I didnt have a can of Rotel but it was still good. I made this for a potluck at work and everyone loved it! 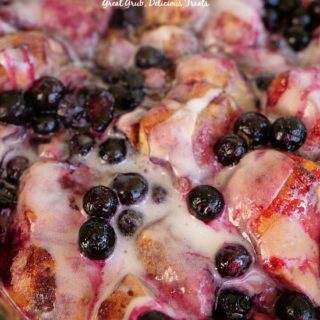 This is in the crockpot now! As soon as I saw this posted I had to make it. Made my mouth water just looking at the picture! Super easy, can’t wait till it’s done! This is great! And, sooooo easy. Had to do a few things differently due to what I had on hand. Used 8 boneless skinless chicken thighs and had picked up HOT green chilis by mistake. Was a great mistake. Added just a bit of kick. Grocery didn’t have a 28oz can of green enchilada sauce so used 3 10 oz cans. Lots of liquid when finished cooking. Served it over brown rice. Was delicious. 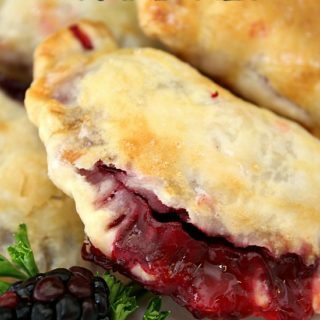 Definitely a keeper recipe. Thank YOU!